Water tank float valves available for sale at wholesale prices. Plastic-Mart water tank float valves are made from non-corrosive materials and feature a heavy duty PVC body with Santoprene seals. The float falves that Plastic-Mart sells are made from materials that have been NSF approved and stainless steel hardware graded 18-8. Our float valves have no seams so the chance of leaking is minimized and they are highly resilient to sunlight deterioration. 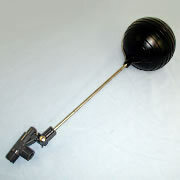 These float falves ship with lever brackets that allow the float valve to be used in an upside down position if required. The float falves also come with a lever that features two fulcrum positions to increase control over flow rates. The flat balls themselves are constructed out of high density linear polyethylene.